Also one of our Members Cars...Nice Ride Isn't it ! That is pretty sick ride. Not to throw this down on this car but when I saw the wheels on this car it reminded me of how badly I dislike black wheels on ANY car. The looks of this blue car are very sharp. Love the front doors. The owner of this car put mega bucks in to the customization. But when the black wheels (regardless of the matching blue trim ring around them)were added, it ugly'd up the car and made it look cheap. This is just my own personal opinion and preference of course. i like it, mainly cause its same gen as mine but i love the blue, and the black rims, shaved handles, eyelids. dislike the flip doors, id like to see blacked tails, and turns and tint to match the wheels. maybe a little bit of black pinstriping to accent. but thats whats good about a honda i guess, no two are every alike, unless its a straight copy. I never understood spending money upgrading a car that's not worth much to begin with. The car has rice-a-roni all over it. 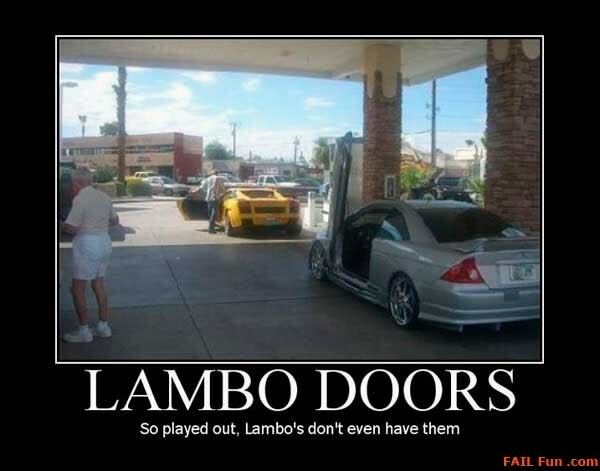 I still like the Lambo doors, every time I see one I get to wishing I had them on one of my cars..